I’m leading a workshop this weekend with Ashley Aron, a fierce style queen & theatre maker, at the Cedar Cottage Neighbourhood house. This workshop is building on research I started while in residence at Elsewhere this past August, and eventually, it will inform a new performance that I’m starting to create. There will be clothing! crafts! storytelling! tea & cookies! polaroids! All the info is below, and the facebook event is here. 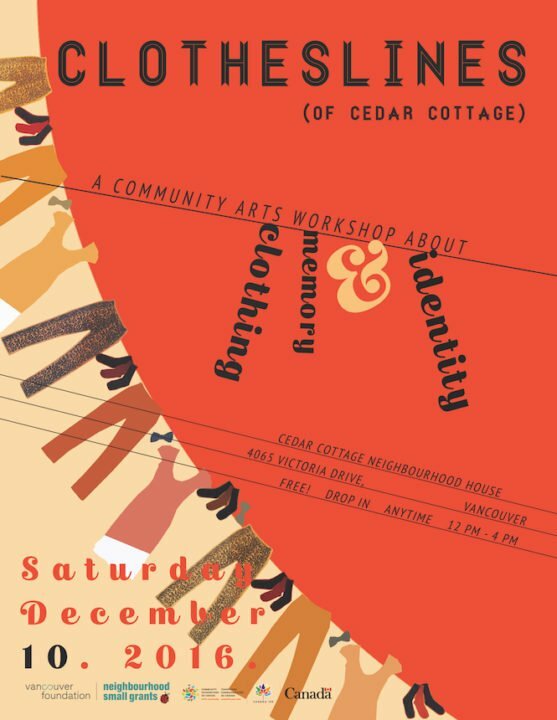 Drop in to the Cedar Cottage Neighbourhood House between 12:00-4:00 pm on Saturday, December 10th and take part in a fun, hands-on workshop that looks at memory & identity through the lens of clothing & style. Free & open to all ages. Have your photo taken & tell us about your outfit. Don’t worry – every piece of clothing has a story, however small! Bring in an item (or items) of clothing to give away, and tag them with a story or memory. They’ll become part of the Community-sourced Closet & the clothing swap at the end of the day! This initiative is made possible by the Community Fund for Canada’s 150th, a collaboration between The Vancouver Foundation; Kiwassa, Cedar Cottage and Frog Hollow Neighbourhood Houses; the Government of Canada; and extraordinary leaders from coast to coast to coast. Powered by WordPress. Design based on LESS.